U.S. Secretary of State Mike Pompeo, right, greets a young Venezuelan migrant at a migrant shelter, as he's given a tour by Colombian Vice President Marta Lucia Ramirez, behind, and Colombian President Ivan Duque, not in picture, in La Parada near Cucuta, Colombia, on the border with Venezuela, Sunday, April 14, 2019. Pompeo is on a four-day Latin American tour, making his final stop at the Colombian border to meet with representatives of Venezuelan refugees. 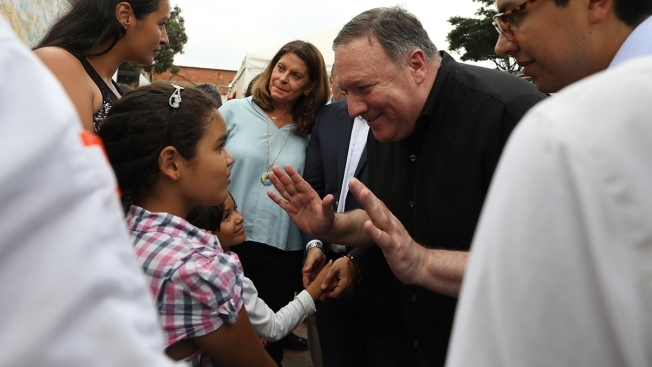 U.S. Secretary of State Mike Pompeo met with Venezuelan migrants in Colombia on Sunday as he wrapped up a four-nation tour of South America aimed at pressuring Venezuela's socialist president, Nicolas Maduro. Pompeo described a "very moving" encounter with a Venezuelan mother named Geraldine who crossed into Colombia and was torn about abandoning her country even as she had to scavenge for diapers, medicine and other basic goods she could no longer find in Venezuela. Mimicking President Ronald Reagan's famous "Tear down this wall" speech in Berlin at the end of the Cold War, Pompeo urged Maduro to lift a military blockade preventing the entry of tons of humanitarian aid that has sat for months on Venezuela's borders with Colombia, Brazil and the Dutch Caribbean. "Mr. Maduro, open these bridges, open these borders. 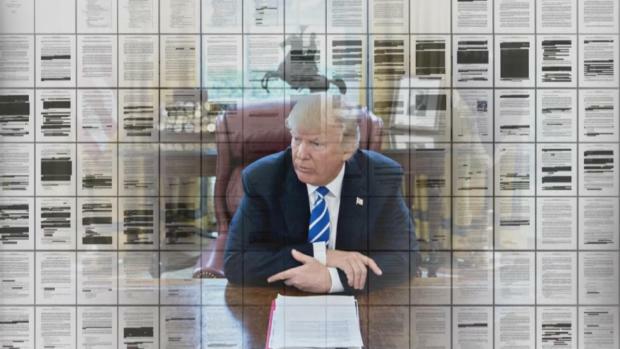 You can end this today," Pompeo said. "I hope you will care now when you see the horror, when you see the tragedy, to change your ways and to leave your country." The U.S. was the first of more than now 50 nations that in January recognized Venezuelan opposition leader Juan Guaidó when he declared himself his country's interim president. The opposition, with the support of the U.S. and the other countries, Maduro's re-election last year to be illegitimate because leading critics were barred from running. But significant popular support for Guaidó at home hasn't loosened Maduro's grip on power, and the embattled leader continues to enjoy the support of the armed forces, the traditional arbiter of political disputes in Venezuela. Authorities in Venezuela have accused Washington of plotting Maduro's overthrow and even blamed it for a failure of the electrical grid last month that left much of the country without power for days. On Sunday, a top official ridiculed Pompeo's visit to the border. "Confirmed: Washington and Bogota ratify Cucuta as the regular stage for their most decadent and cheap spectacles," Foreign Minister Jorge Arreaza said in a message on Twitter. "In the meantime, the abandoned people of Cucuta continue to live off the Venezuelan economy." When pressed by a reporter on whether the generosity shown Venezuelans fleeing Maduro is in conflict with the Trump administration's hostile policies toward migrants on the southern U.S. border, Pompeo called the comparison "ludicrous." "People are starving because Nicolas Maduro is denying food that is sitting here. This is horrific. There is nothing else like this," Pompeo said while flying back to Washington.